Jeff Wallack is entering his 12thseason as head coach of the St. Francis High School football team. His experience doesn’t stop there. 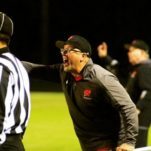 Wallack was an assistant football coach for eight seasons, camp Director, two-time head coach of a Conference Championship team, and WFCA SE Region Coach of the Year. Throughout all of these opportunities, he has found several rewarding moments from coaching kids. First, he believes it establishes his own personal self-worth through the ability to positively impact somebody. Second, he loves seeing the skills taught to kids being consciously used in games, as it is not only a sign that they are listening but also that they value his teaching. Finally, he has seen many kids that he has coached in the past come back to him to just “check-in” and let him know that they are doing well, which signifies that he successfully formed an important lasting relationship with his players. Wallack sees these meaningful moments reflected in the participation of the NFL Alumni Heroes during camp. He believes the Heroes always have a positive impact on the camps, as regardless of each respective hero’s NFL experience, kids love the idea that they are listening and meeting somebody who has played. Through the teachings of his father and his head coach, he adopted the philosophy that hard work makes good things happen. He tries to carry this viewpoint to everything he does, both in football and in life. Want to join Jeff Wallack at camp?